Jesus made Wine, really good wine! (Proverbs 3:5-6) So, how could making beer be so bad? In my opinion, it's not, as long as you don't use the beer for sinful purposes. Getting drunk is a sin and often leads to more sin. (1 Corinthians 6:9-10) Drink in moderation for physical and spiritual health. Keep in mind, this also allows for better beer enjoyment. Think quality, not quantity. Tempting your friends who lack self-control is not a good thing, so don’t do it… (Romans 14:21-22) While the Bible does not forbid alcohol consumption, it does tell us not to tempt those around us that may be easily corrupted. 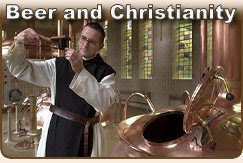 Christians should not cause other Christians to falter... (1 Corinthians 8:9-13) If a fellow Christian does not approve of your home brewing or beer consumption, don’t rub it in their face, save the beer for later. More importantly, if a fellow Christian has previously struggled with addiction, or believes drinking will lead them to further sin, don’t encourage them to drink. These last two points are good guidelines for Christians and non-Christians alike, good life advice that we all could benefit from. God made food & drink as a gift for us to enjoy. (Psalms 104:14-15 & Ecclesiastes 9:7) God gave us the ability to make beverages that "gladdens the heart" and the Bible instructs his people to drink "with a joyful heart, for it is now that God favors what you do." (Amos 9:14) God willed his people to "plant vineyards and drink their wine," perhaps a case for starting your own hop garden! "The Son of Man came eating and drinking, and they say, 'Here is a glutton and a drunkard, a friend of tax collectors and "sinners." ' But wisdom is proved right by her actions." We already know that Jesus made wine, but as indicated above, he also drank. Jesus was a man of the people, he ate, drank and fellowshipped with people from all walks of life. How else would he have gotten his message out to the world if he did not dwell within it? Sadly he was wrongly criticized for this, just as some of us that drink and keep the faith are today. If you consider drinking, making alcohol, and hanging out with so called 'unsavory types' sinful, what does your logic say about Jesus? Something we should keep in mind before we condemn people who enjoy "adult beverages" responsibly and who dwell within the greater community. “Then he took the cup, gave thanks and offered it to them, saying, "Drink from it, all of you. This is my blood of the covenant, which is poured out for many for the forgiveness of sins. I tell you, I will not drink of this fruit of the vine from now on until that day when I drink it anew with you in my Father's kingdom." "On this mountain the LORD Almighty will prepare a feast of rich food for all peoples, a banquet of aged wine— the best of meats and the finest of wines. On this mountain he will destroy the shroud that enfolds all peoples, the sheet that covers all nations; he will swallow up death forever. The Sovereign LORD will wipe away the tears from all faces; he will remove the disgrace of his people from all the earth. The LORD has spoken. In that day they will say, "Surely this is our God; we trusted in him, and he saved us. This is the LORD, we trusted in him; let us rejoice and be glad in his salvation." Good food and drink is the least of the good news in the scriptures above, but it's all good news in my book. A great party, the end of death and suffering and no more sadness. We know there will be the "finest wines" at this feast, hopefully there's some good beer too. Either way, I hope I see you all there for the big party! To the best of my knowledge, the Bible does not forbid Christians from drinking or making beer, wine, or any other drink. Alcohol, like food, is actually a gift from God, and should be enjoyed responsibly in moderation. The ability to grow the necessary ingredients , and then turn them into fine beverages is also a gift from God. So, from what I can tell, home brewing and then enjoying the fruits of your labor is a good thing! That being said, drunkenness and addiction are sins, and should be avoided, and we must be careful not to corrupt those around us. If you can not handle alcohol responsibly, as God intended, it’s best to avoid it. In case you missed them, here are Part 1, Part 2, and Part 3..
Do you have other related links? Please post a comment and I'll add them to the post. I look forward to your feedback, please post a comment, lets discuss! Have you seen beermenu.com yet? Now where was this great tool when I was planning my semi-recent NYC beer tour? They just launched the site today but they already have 1210 different beers listed and where you can find them in the city. Too funny! I wonder if their parents knew they homebrewed, and if they let them sample the fruits of their labor? So, my birthday weekend starts tonight with a tasty dinner with the Misses on a roof top patio restaurant in the local area and a nice cold beer to go with it. Looking at the beer menu on line for this place I see they offer Anchor Steam's Liberty Ale. Coincidently, 33 years ago today, Anchor Steam's Liberty Ale was born... So crack open a Liberty Ale with me this weekend and wish us both a Happy Birthday! Liberty Ale was first introduced on April 18th, 1975 to commemorate the bicentennial of the famous ride by Paul Revere. Before it became a permanent year-round product, variations of our Liberty Ale formula enjoyed brief tenures as Our Special Ale, available at Christmastime. Tomorrow morning, I'm brewing up a batch of Witbier, and then heading out for a brunch of sorts at the local watering hole. After that, I'll see where the night takes me! Getting drunk is a sin and often leads to more sin. (1 Corinthians 6:9-10) Drink in moderation for physical and spiritual health. Keep in mind, this also allows for better beer enjoyment. Christians should not cause other Christians to falter... (1 Corinthians 8:9-13) This guideline is closely related to the one above. If a fellow Christian does not approve of your home brewing or beer consumption, don’t rub it in their face, save the beer for later. More importantly, if a fellow Christian has previously struggled with addiction, or believes drinking will lead them to further sin, don’t encourage them to drink. “He makes grass grow for the cattle, and plants for man to cultivate— bringing forth food from the earth: wine that gladdens the heart of man, oil to make his face shine, and bread that sustains his heart." If we take those basic definitions at face value, it’s a logical jump, in my mind, that the scripture reading means that God allowed us the ability to make alcoholic beverages as a means to find enjoyment. As a home brewer, I take pleasure in crafting a quality beverage from the barley and hops God has provided. Eating and drinking with friends and family creates a social environment that often leads to great fellowship. The trick is not crossing that line between healthy fellowship and that inappropriate feeling of alcohol induced stupidity previously mentioned in part 1 of this little series. Knowing where that line rests is best left as a personal decision of conscience. If you have doubts, put the glass down. "Go, eat your food with gladness, and drink your wine with a joyful heart, for it is now that God favors what you do." This verse tells us to take pleasure in food and drink, it’s God’s will and proof that he does in fact love us and wants us to be happy! This verse reminds me of the now infamous misquote (incorrectly attributed to Ben Franklin) "Beer is proof that God loves us and wants us to be happy." The real Ben Franklin quote discusses Jesus' miracle of turning water into wine and equates that to the every day gift of rain and its effect on the growing grapes in vineyards that are destined to become wine. "We hear of the conversion of water into wine at the marriage in Cana as of a miracle. But this conversion is, through the goodness of God, made every day before our eyes. Behold the rain which descends from heaven upon our vineyards; there it enters the roots of the vines, to be changed into wine; a constant proof that God loves us, and loves to see us happy." Franklin clearly enjoyed a good glass of wine, rather than beer, and praised God for it as a gift. I don't think it's a far leap to view barley, hops and ultimately beer as additional gifts from God, do you? I will bring back my exiled people Israel; they will rebuild the ruined cities and live in them. They will plant vineyards and drink their wine; they will make gardens and eat their fruit. In Amos 9:14, the bible discusses drinking wine from your own vineyard as a sign of God’s blessing. Perhaps drinking beer from your own home brewery isn’t so bad either? Maybe I should start my own hop garden after all… These last couple of versus directly relate to making your own wine, but I think these versus could soundly be applied to brewing your own beer as well. Yes, the Bible does warn about the dangers of alcohol, but it also says a lot of wonderful things about it too. Above are just some of those positive comments the Bible has to offer. In a nutshell, God has given us the ability to plant crops and turn those crops into beverages for our enjoyment. To enjoy a fine beverage, to awe in its complexity, flavor, aroma and appearance can be equated to appreciating a beautiful view in nature. Appreciating what God has given us, responsibly, brings glory to him and enjoyment to us. Crack open a quality bottle of beer this evening and Thank God for it! Next time, we'll wrap up this series, and discuss Jesus and his own use of alcohol. This may be a bit controversial, but you won't want to miss it. In case you missed them, here are Parts 1 and Parts 2. More to follow, Cheers and God Bless! OK, taking these two points at face value, making beer (or wine) is not a bad thing to do. And by extension, drinking the end results of that effort is also OK, as long as it is done in moderation. Sounds pretty simple and clear to me, so what's the big deal about alcohol then? Not everyone is mature enough or physically and mentally capable of enjoying alcohol responsibly. For some, drinking responsibly comes easily, but for others, alcohol is something that should be avoided. If you fall into the first category, good for you! But what about your friends and family? Can they drink responsibly? How does your drinking affect them? “It is better not to eat meat or drink wine or to do anything else that will cause your brother to fall. So whatever you believe about these things keep between yourself and God. Blessed is the man who does not condemn himself by what he approves." It’s interesting to note that this scripture reading discusses both food and drink. People of faith are often ready to condemn folks when it comes to alcohol consumption, but what about those that over eat? Is gluttony not a sin? Should overweight Christians be held in the same view as Christians with alcohol problems? This is debatable. Alcohol abuse can have many consequences that are external to the abuser, negatively affecting the people in their lives. While over eating tends to have more internal health related consequences for the individual. In any case, neither are good practices. "Be careful, however, that the exercise of your freedom does not become a stumbling block to the weak. For if anyone with a weak conscience sees you who have this knowledge eating in an idol's temple, won't he be emboldened to eat what has been sacrificed to idols? So this weak brother, for whom Christ died, is destroyed by your knowledge. When you sin against your brothers in this way and wound their weak conscience, you sin against Christ. Therefore, if what I eat causes my brother to fall into sin, I will never eat meat again, so that I will not cause him to fall." Clearly God does not want Christians to do anything that might offend other Christians, or worse, encourage them to sin against their conscience. Hopefully my discussion of this very topic does not offend other Christians (or anyone else for that matter), as this is not my intent. Here’s my take on the 1 Corinthians 8:9-13, as it relates to alcohol. If a fellow Christian does not approve of alcohol, don’t rub your differing opinion in their face, save the beer for later. More importantly, if a fellow Christian has previously struggled with addiction, or believes drinking will lead them to further sin, don’t encourage them to drink. That seems like fair and sound advice to me, how about you? I think we can all agree that the Bible provides some clear guidance on alcohol consumption. Don’t be a drunk, and don’t tempt or offend others (Christians or non-Christians) who lack self control or have different opinions on the topic. All great advice, even if you're not a Christian. Now that we got the list of "things not to do" out of the way, I'll go into what the Bible tells us we can do in my next update. The Bible tells us that ability to make and savor great beverages is a gift from God, to be enjoyed! So stay tuned , you might be very surprised what the Bible has to say! More to follow, Cheers and God Bless! 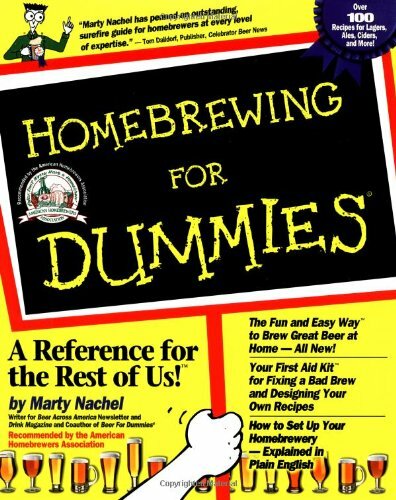 As a life long Christian, I’ve had to do some serious soul searching regarding my hobby of home brewing. 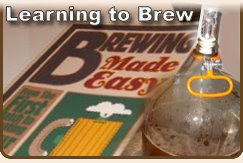 I can honestly say that learning to brew my own beer has helped me gain a more mature and responsible view on alcohol consumption. But, it wasn’t until I began to dig into the bible that I truly learned what God’s views on alcohol are. This is my way of acknowledging God, and ensuring my trivial little hobby does not conflict with my faith. After doing some reading and thinking, I don’t think it does. “They did so, and the master of the banquet tasted the water that had been turned into wine. He did not realize where it had come from, though the servants who had drawn the water knew. Then he called the bridegroom aside and said, "Everyone brings out the choice wine first and then the cheaper wine after the guests have had too much to drink; but you have saved the best till now." When Christians are confronted about their alcohol consumption, they often turn to the scriptures that tell us about Jesus' wine making miracle. Yes, Jesus made wine from water for a wedding. Can alcohol be so bad if Jesus actually made wine, specifically for a party? The verse even comments on the fact that the wine Jesus made was “good wine” and not the cheap stuff you would typically serve guests after they've had a few drinks already. In life, when faced with a dilemma, we're often asked, "What would Jesus do?" In this case, he wouldn't serve low quality booze. In today's terms, it would be like running out of beer at a party, only to have a stranger walk up and make a batch of the best home brewed beer imaginable in seconds. think Trappist Westvleteren 12 quality, and then serving this miracle treat to your guests. Most folks would have made an emergency beer run to the corner package store for a couple 30 packs of Bud Light. Jesus certainly set a high bar for party planners throughout history. The bible is clear on this, being a drunkard is a sin, right up there with stealing from others or cheating on your spouse. But how do you define the term drunk? If you are a true connoisseur of quality beer, why would you want to get drunk? Drinking in moderation enables you to savor and appreciate the nuances of the beer you’re drinking. After all, the brew master went to all that effort to create something special, why would you gulp it down and not take the time to appreciate it? That would be like dumping ketchup and salt on a very expensive gourmet meal and then scarfing it down without savoring it. Why bother with the fancy restaurant if you’re not going to enjoy the food on your plate? Most of us have the maturity not to do that to a fine meal, why should things be any different when it comes to the beverages in our glasses? Writing detailed reviews of beer is an interesting process that trains you to slow down and think about what you’re putting into your body. It enables you to consider the beers qualities, flavors, textures, colors and even its potential affects on your body. If you haven’t tried it, I encourage you to review the next beer you drink, you just might learn something! Next time, I'll discuss some other alcohol related guidelines I've found in the bible, as well as some versus that I feel promote the healthy enjoyment of alcohol as an actual gift from God. So stay tuned, there's more to come! In the mean time, here's a little video about Westvleteren beer, "a mythical beer brewed in small batches by Trappist monks"... 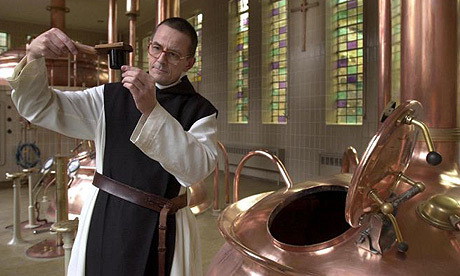 It's brewed by actual monks!!!! Flying Dog Brewery Garde Dog Biere De Garde from Flying Dog Brewery on Vimeo. The generous folks from Flying Dog have done it again... They've sent me free beer in the mail (for my reviewing purposes), God bless them! FYI, if any other kind and generous breweries out there who value the opinions of an average guy and the word of mouth marketing power of your friendly neighborhood beer blog, please let me know... 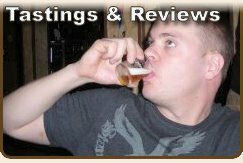 I'll be happy to taste and review your beer on my blog any time. Just send me a sample and some documentation about your beverage and I'll make it happen. How generous of me. Interested? Then contact me here: bryon[@]homebrewbeer.net and we'll set something up! 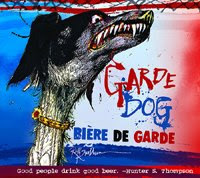 Proving the French may actually know something we don't... Garde Dog is a traditional French Biere de Garde or "beer for keeping". This classic farmhouse ale was brewed in March for drinking during the spring and summer months. With it's toasted aroma and spicy, malty sweetness Garde Dog will liberate you from the winter doldrums. Style Description from our friends at BeerAdvocate.com: Despite its name, a The Biere de Garde is golden to deep copper or light brown in color. They are moderate to medium in body. This style of beer is characterized by a toasted malt aroma, slight malt sweetness in flavor, and medium hop bitterness. Noble-type hop aromas and flavors should be low to medium. Fruity esters can be light to medium in intensity. Flavor of alcohol is evident. Earthy, cellar-like, musty aromas and flavors are okay. Diacetyl should not be perceived but chill haze is okay. Often bottle conditioned with some yeast character. 1. Appearance - This is a pretty beer, nearly crystal clear with a rich golden color with an initial two finger head built from tiny happy little bubbles, very satisfying, vibrant and alive. Begs to be ingested and enjoyed. Almost done! Goes down easy! 3. Taste - A sweet yet slightly spicy malty flavor. Mild hops make for a well balanced yet complex brew. I briefly detected hints of something akin to fruit (apple or orange?) and rye. A very pleasant and distinctive flavor; sweet, but not overbearing. Went well with the Thai food I made for dinner, but would go better with some Pan Asian Tuna! 4. Mouthfeel - Light but still substantial and satisfying. Ample carbonation gives it a little extra kick while avoiding over carbonation. 5. Drinkability - Good stuff! This is an extremely drinkable beer. A great warm weather brew that cries out for those nights on the patio. Manages to go down easy while maintaining enough character and complexity to make you want to savor it.